Creative Pathways is a is a partnership between engineeredlearning.co.uk and Derby City Council that enables young people from across the city to enhance their design and fabrication training through a creative learning programme. Students from EL are engaged in public realm solutions and structures in the form of "Engineered Artworks" with all the artworks funded by local developers, sponsors and supported by local communities to improve the identity of their places. "Working with Derby Public Art has been embraced by Engineered Learning's students, enabling young people to actively participate in developing and taking ownership of their own environment, not only developing new skills to support their own futures, but also leaving their mark for generations of the future to enjoy." Dan Read Engineered Learning. This is the first phase of the Creative Pathways scheme and is sponsored by local businesses Aldi and Merril College and delivered to you by Sustrans and Derby City Council. The ‘Engineered Artworks’ have been designed by the students of Kingsmead School and Engineered Learning, in partnership with the community, Specialist fabricators Arc Creative were appointed to refine the design, construct and install the artworks that are due to be installed this summer. Please take a look at the how the structures were developed by the students in the pages below. Additional structures are currently being designed for the Dunelm Pride Park area. The map shows the proposed locations for installations along the canal cycle and pedestrian path. (National Cycle Route Route 6). A little about the companies involved. Engineered learning: Constructing the future! Engineered learning is the brainchild of the companies’ founder and director Dan Read. Engineered learning provides work experience for school pupils aged under 16, and can eventually lead to qualifications in welding and steel fabrication. In specially tailored programs, the students learn not only practical skills and safety management, but also teamwork and dedication. Sustrans: Shaping our way home! Facilitating art projects along Derby’s foot and cycle paths is one of the key ways Sustrans has had an impact on our daily journeys. Arts worker Brendon McDowell was appointed by Sustrans to lead the community engagement and build on the ideas already generated in workshop sessions at Engineered Learning. The three students involved in the project, were introduced to the scheme with a site visit to the Wilmorton site. After this there were 6 workshop session where I worked with the students to come up with concepts and create prototypes. The students also worked on the prototypes and other concepts outside of these sessions. "It was a great pleasure to work with the students and staff at Engineered Learning. There was some great ideas generated by all and impressed by the quality of the welding, cutting and grinding. As you can see from the photos there were many ideas and concepts that were tried, some more successful than others." Brendon McDowell, Sustrans consultation and arts-worker. We had several community engagements, not only along the Cycle path but also at local events. Including St. Mary's church fair and the Alvaston Park summer community event. There were a total of 9 community engagement sessions, each one drawing on average 15-20 members of the public passing buy. Both the Alvaston Park Summer event and St Mary's Church Fair was more like 20-30. Many people did not want to give there contact details but lots of people took flyers and discussed their fears and wishes with us. In the early consultations it was clear that the greatest need was for more seating. But also that people where interested in different aspects including the possibility of bike rings planters and Bins. Derby has a rich history of research production in the aeronautics industry. Specifically the development and production of the Merlin engine used in many of the fighter planes and bombers during WW2. The concept developed was based on the tail end of a Lancaster bomber, which was readily evolved into a spacious communal seater that can be produced in several sizes. Additionally, planters based on rotor­ blades could be added to the outer wings. Derby also has a rich history of research and development in the rail industry. The research facility on London road being very close to one of the proposed sights. This design was developed from the quarter wheel prototype. The students felt a simpler seat design may be more acceptable. The design could then be completed with surface design reflecting more railway themes. The Canal boat concept was developed due to the history of the cycle path this concept was very popular with the public. 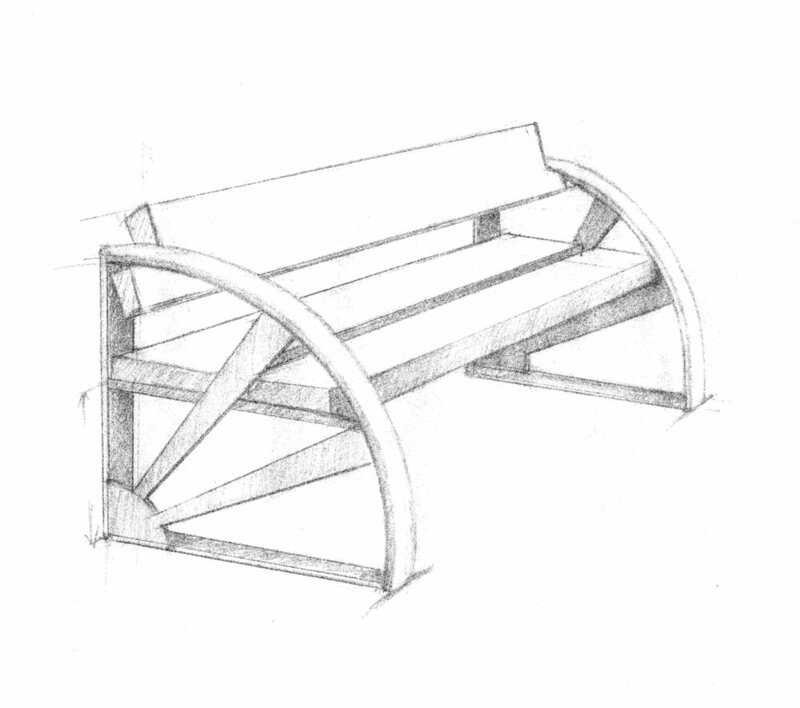 As you can see the bench is a large seater with incorporated planters. One clever feedback idea was to create drainage on the seat that self watered the planters. The back panel can be left decorative or have the addition of cycle ring, notice board and or maps. On the later engagements we conducted a poll to get peoples reactions to the prototypes. The resounding favourite was the canal boat concept, which is also backed up in the quotes section. Both the Lancaster bomber and train inspired concepts received similar amounts of votes. The Lancaster bomber however seemed more popular when we were talking to people. A drawing competition was created to generate ideas for colour schemes and final embellishments to the three developed prototypes. Here are some of the entries. What they might look like in place! Three designs where developed into prototypes and are currently being finished at engineered learning. There are a number of more raw parts prototypes that have been created including a quarter train wheel and a rotor blade inspired planter.